Ovechkin was held pointless Sunday but led the team with six shots on goal as part of a 3-2 shootout win over the Rangers. 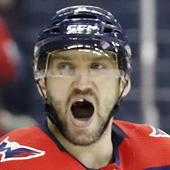 The Russian sits third in the NHL with 266 shots, as Ovechkin remains one of the biggest threats to score in the league. Sitting at 45 goals, Ovi figures to crack 50 before the season is over, which would give him six campaigns of 50-plus goals (back in 2007-08, he scored 65, the one and only time No. 8 has scored 60 or more in a single season).